Looking to spruce up your patio or pool area with an Outdoor Kitchen? Let Ebie Construction create your Florida outdoor oasis that reflects your personality and taste, all while staying within your budget. We provide only the highest quality of products. We guarantee that your new outdoor kitchen and personal oasis will be very durable, constructed to withstand some of natures harsh conditions. 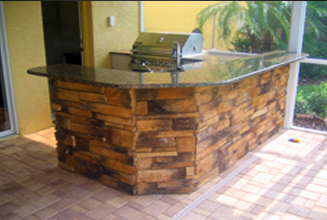 Our custom outdoor kitchens are among the best in the Tampa Bay area. We take pride in our unique one of a kind designs and superb craftsmanship. Our company offers a wide variety of cabinetry and countertops to make your outdoor kitchen blend right in with its surroundings. Our custom outdoor kitchens also provide optimum space for storage giving you plenty of space for all your outdoor culinary needs. We guarantee that you and your guest will enjoy your new outdoor kitchen.